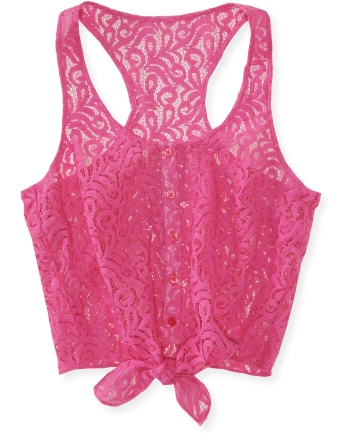 This incandescent pink lace tank from Aeropostale is perfect to celebrate sunny rays and lemonade days. Tap into the front-tie trend with this bold and feminine color, and pair it with a pair of colored skinnies to achieve a great spring look. We love how simplistic and perfect this American Eagle dress is for your next garden party, day outing, or picnic at the park. The neon yellow color is amazingly flattering for many, and gives you the opportunity to try some complementary funky jewelry. 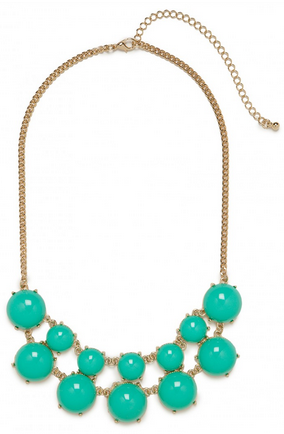 The glam hue of this BaubleBar necklace will perfectly elevate a fresh spring ensemble! Pair it with a monochrome outfit (a pale yellow would be great) for an element of surprise, or add it to a white tee and fun skirt to add some girly glam. Ballet flats are the perfect spring shoes: feminine, sophisticated, and versatile. 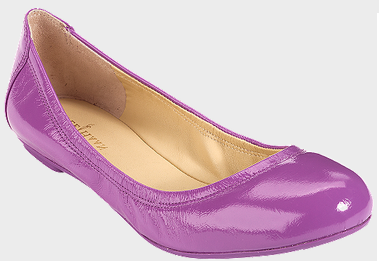 We are in love with these Cole Haan Aster Purple Patent flats (also in black, empire blue, sea green, orange, sandstone, and sunlight) and love that they would add an incredible pop of color to any outfit! 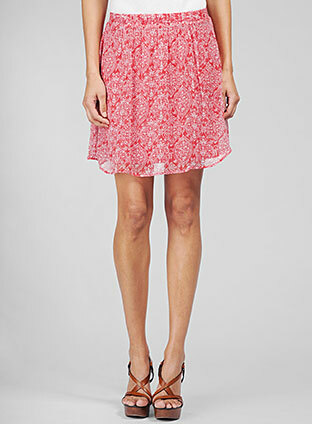 This classic Ella Moss statement skirt is a must-have for your spring wardrobe! The paisley pattern in red is sweet and unique, and the movement and lightness of the skirt is perfect for a Sunday brunch or outdoor lunch. Stay up-to-date with promotions and sales through signing up with Shopilly! Connect with your favorite brands and be the first to hear about sales so you can snag all of your favorite items to achieve the perfect spring closet. As the Kate Spade brand so succinctly reminds us: live colorfully for the spring season, with Shopilly! Rachel Parcell is a 21-year old, multi-talented fashionista who channels her creative energy into three different jobs—designing clothing for Modbe, designing accessories for DownEast Basics, and moonlighting as a fashion blogger at Pink Peonies. Be sure to check out her blog or stay updated on her fashion excursions by connecting with her through her social media platforms (Facebook, Twitter, & Pinterest). At Shopilly, we love her experimental and fresh take on fashion. She has fun with prints, colors, and textures to create one-of-a-kind looks that always look flawless from head-to-toe. Her blog is the perfect source of inspiration for members of the fashion community as they embark upon their own personal style journeys. 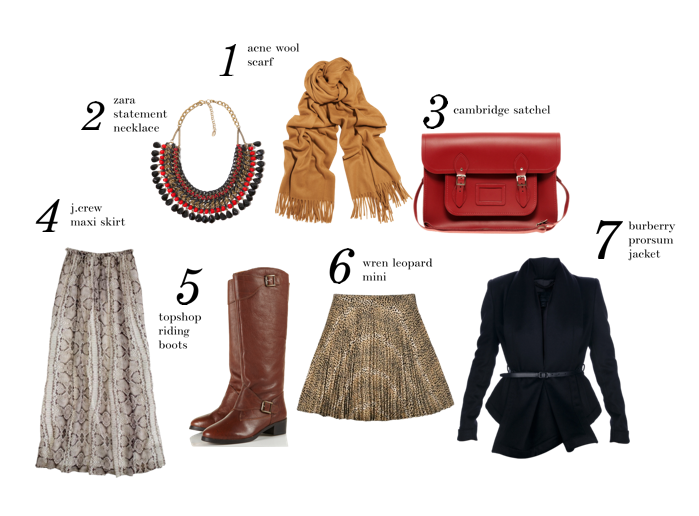 The blog features an elegant design with high-resolution photography and beautiful outfit-of-the-day posts. Common brands worn include J. Crew, H&M, Prada, Stella & Dot, among others. Beneath each picture is a list of all the items she is modeling in each look, with links directly to the product so that you can purchase them right away. Our favorite look right now is her “On the Bright Side” ensemble, featuring J. Brand dark wash jeans, a fuchsia J. Crew sweater, a heather gray J. 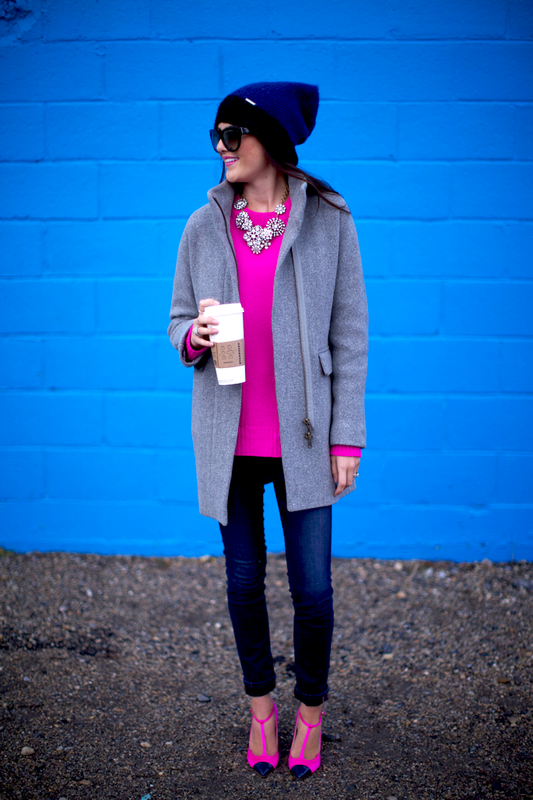 Crew coat, a Michael Kors beanie, Prada sunglasses, color blocked J. Crew heels, and a stunning statement necklace from J. Crew. Effortlessly chic and bright! Shopilly is the perfect shopping service to for fashion bloggers to connect with their favorite brands and stores to stay updated on promotional sales. With easy access to the best deals, bloggers can purchase coveted items at the cheapest price possible to feature in outfit-of-the-day or inspiration posts. Sign-up with Shopilly here! In celebration of Forever 21’s 30% off Sweaters + Blazers sale, we have curated a list of our five blazer favorites. Blazers are the ultimate way to hold on to your favorite fall pieces while still staying weather-conscious during the wintry season. They are also extremely versatile, and are perfect for both a day and night look! Read on to see if your favorite blazer has made the cut. This J. Crew blazer in caramel is perfect to give your ensemble a classy finish, with crested gold buttons as a subtle yet luxe detail. Pair it with a white Oxford button-down shirt and fitted jeans for a casual cool look or with your favorite LBD for a dressier look! We like the versatility of this neon coral blazer with gray trim from Gap; pair it with a simple monotone dress to create a business casual look, or experiment with some color-blocking for a fun day look. This oxblood blazer from American Apparel is a staple for any wardrobe. This makes our list because of the beautiful simplicity of the blazer’s construction, the merlot color, and the fitted and single button details! 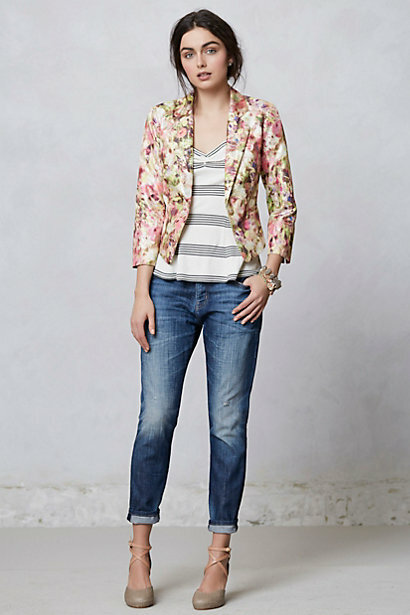 We are obsessed with this floral number from Anthropologie, inspired by the natural beauty and bold hues of Ecuador and the Galapagos Islands; throw this blazer on for an artsy glam look. This H&M gem rounds out the list. This fitted jacket in a soft, denim-like linen blend is an exciting hybrid between a classic denim jacket and a standard modern blazer. We are loving the result! Which one is your favorite? Be sure to stay up-to-date with sales and promotions by following brands like H&M, J. Crew, Anthropologie, Gap, and American Apparel on Shopilly! Kate Spade, one of my favorite brands, will be launching a new line called Saturday. I’m so curious to see what this ‘Saturday’ is all about. I’m guessing it will be super chic, casual weekend garb and I can’t wait to see it. Then I read the small print, it won’t be available until SPRING 2013!? After a tiny pause, I signed up at Saturday.com to be in the know (6 months in advance!) realizing that using my Shopilly email makes this stuff a no brainer. Soft spun cashmere. Sumptuous leather boots. And layers, layers, layers! Thanks to just-right temps and stores brimming with new arrivals, there’s no time like fall that inspires us to put our most stylish foot forward. Want to give your look a quick update? Reach for these lovely layers to carry you through the season (and beyond). 1. The ultimate fall accessory? A long, luxurious scarf to layer over jackets, dresses and knits. We love this one by Acne ($140, net-a-porter.com), crafted of super-soft wool in a deep camel hue that lends a touch of richness to any outfit. 3. Swap your dark leather handbag for something more vibrant, such as Cambridge Satchel Company’s leather crossbody ($158, asos.com). The clean, simple shape makes it ideal for both work and weekends, while the cherry red hue adds a cheerful pop of color. 4. Don’t put away your summer clothes just yet—rework pieces, such as a billowy maxi skirt, into your fall wardrobe. Pair this one by J.Crew ($475, jcrew.com) with a shrunken leather jacket, wooly scarf and boots and—voila!—an unexpected cool combo. 5. Brown leather riding boots (such as Topshop’s, $180, topshop.com) are a quintessential fall staple for good reason—they’re comfortable, pair as easily with tucked skinny jeans as they do a flirty mini, and no matter how many years pass, they’ll never go out of style. 6. Elevate your basics with animal prints. This floaty skirt by Wren ($250, bonadrag.com) is sure to add an instant dose of glamour to a black turtleneck and tights or boots and a shrunken blazer. 7. Finally, if there’s one piece you splurge on this season, make it a classic, go-everywhere jacket, such as this cashmere blazer by Burberry Prorsum ($2,460, farfetch.com. Swoon). Treat it like a top and wear it belted with a pencil skirt or black stovepipes now, then layered underneath a warm vest or coat once it gets colder. The timeless shape, luxurious fabric and ultra-flattering fit ensures you’ll keep it in your closet forever.